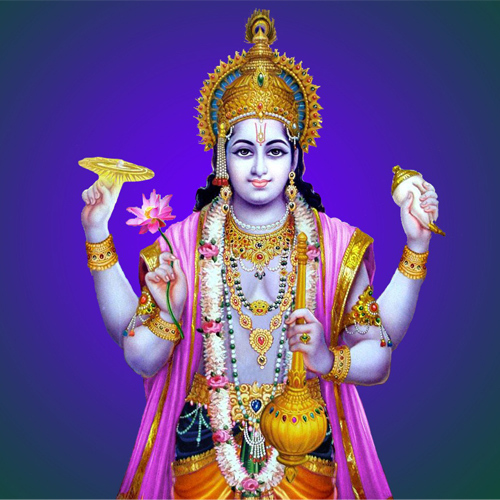 Thursday is dedicated to Lord Vishnu and Lord Brihaspati, the guru of gods. Hence, this day is called Vrihaspativar, after the apportioned god. Thursday is also popularly known as Guruvar. Devotees listen to devotional songs, such as 'Om Jai Jagadish Hare' dedicated to Lord Vishnu on this day. Devotees adorn yellow colored clothes and offer yellow flowers to propitiate god Vishnu and Vrihaspati. They fast throughout the day and consume food only once which consists of 'chana daal' (Bengal Gram) and 'ghee' (clarified butter). The food color used is yellow. Many offer banana or plantain to god. In Bengal, they worship goddess Lakshmi and elsewhere, people also visit Hanuman temples on Thursdays.